As agriculture is so reliant on water, shortages can have a severe impact upon the profitability of Farms. It is therefore vital for food production that farmers take steps to safeguard water supplies. A recent WWF report reveals that the UK is only 38 per cent self-sufficient in water and that agricultural products account for 73 per cent of the UK’s water footprint – the equivalent of 3,400 litres per person per day. Of the total agricultural water footprint (73%), 60% of this water is used for crop production and 40% for livestock production. 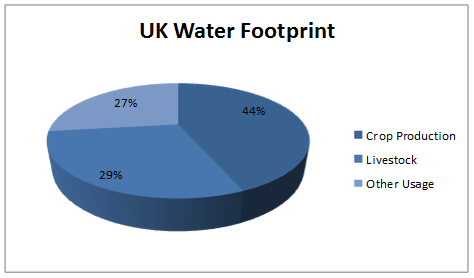 This means 43.8% (44% in above pie chart) of the total UK water usage is for crop production. The amount of water used to produce 1kg of beef is a staggering 15,500 litres of water, poultry 4,000 litres and wheat 1,300 litres. A single cow needs to drink at least twice as much water as the amount of milk it produces. So that is approximately 90 litres to produce 45 litres of milk. Further-more, when the milk leaves the cow it is at 101°F and has to be promptly cooled and stored at 40°F using cooled water passed over a plate heat exchanger. It is becoming increasingly more important for Farmers to consider ways in which they can reduce, reuse and replenish their water sources. Here at Waterseekers, we endeavour to help you best use this precious resource – cost savings & better water for good health. So, please call us on 01246 743022 or make an enquiry on our website, where you can ask questions and/or give details about your water well (water borehole) project.